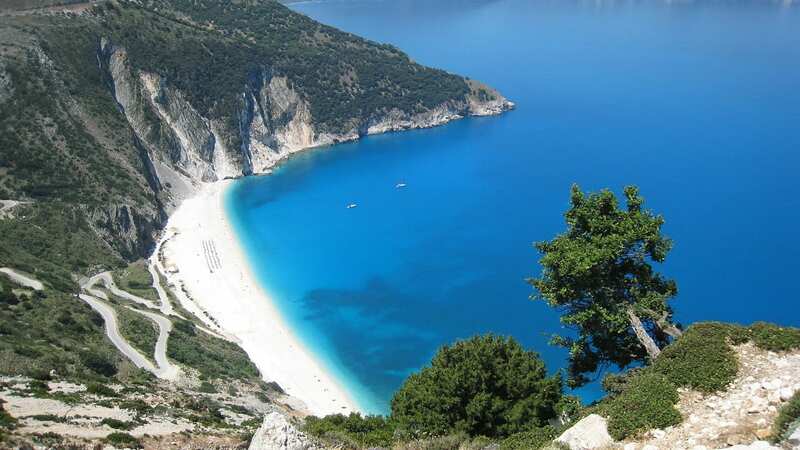 Here's some great suggestions of things to do in Kefalonia. From exploring caves to visiting the best beaches in Kefalonia, this beautiful Greek island has a lot to offer. Kefalonia is the largest of the Greek islands in the Ionian island chain. Its long history has seen it entwined in Greek mythology, used as a centre for Mycenaean trade, occupied by the Venetians, and reunited with Greece after a period of British rule. During World War 2 it was first occupied by the Italians, who were replaced by Germans after 1943. A resulting stand-off between Italian and German forces ended up with thousands of Italian troops executed, which formed the basis of the book and film ‘Captain Corelli's Mandolin'. Today, Kefalonia is a welcoming destination for people who like to experience all the best bits of Greece – authentic culture, historic sites, incredible beaches, and friendly people. Kefalonia is big enough to spend a week on. Two if you have them. Stay any longer, and you're in danger of never wanting to return home! 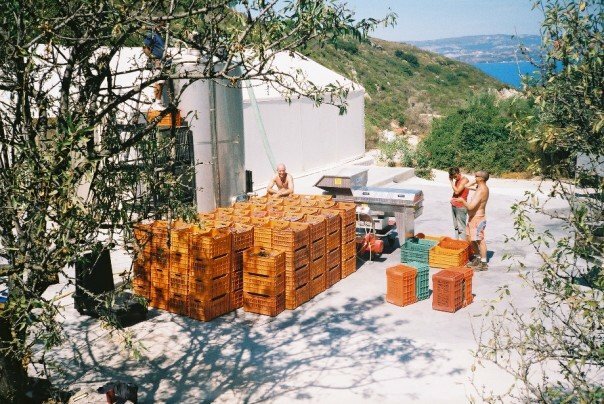 I first visited Kefalonia back in 2004 when I stayed there for a couple of months grape picking. I'm the one on the left taking a rest after stacking those full crates of grapes! It was a pleasant way to spend the last days of summer and early autumn, and I had a lot of fun experiences. I particularly remember helping some Nuns pick grapes at their nunnery! 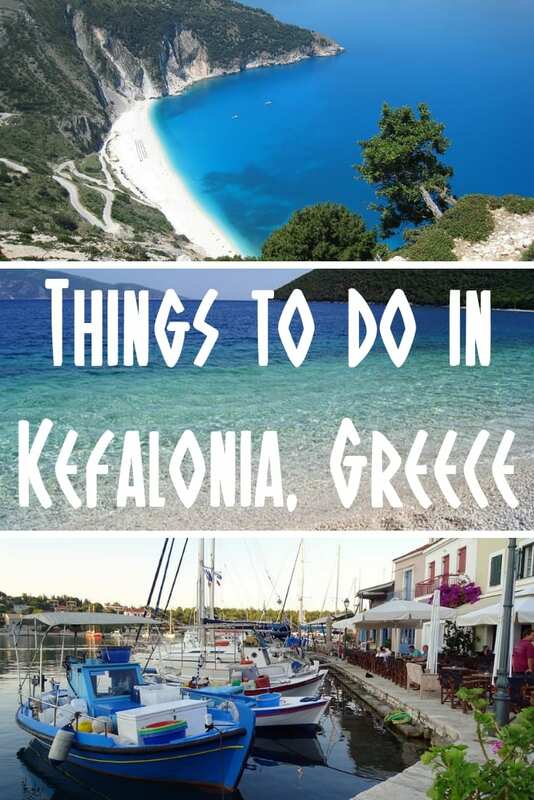 Some of the places and activities I've included on this list of things to do in Kefalonia I've tried myself. Others, I would have loved to do if I'd had the time. One thing's for sure, that despite its relatively small size, there's plenty to see and do in Kefalonia. What you don't see during this vacation in Kefalonia, you can leave for next time! But I'm going to kick off by suggesting a wine tour in Kefalonia. Kefalonia is famous for its local wine known as Robola. The grape variety of the same name from which it is produced is ideally suited to the limestone soils of Kefalonia, and production is plentiful. No matter where you eat on the island, Robola will always be available to accompany your meal. Whether from a large winery or from your hosts private label production, you have to try at least one bottle of Robola during your visit to Kefalonia. I would suggest taking things a step further though, and put some time aside for a winery tour. Not only will you be able to see the processes behind wine production, but you'll also learn some island history and of course taste several different types of wine in the process! There's plenty of opportunities to take wine tours in Kefalonia, and the tours detailed below gives you an indication of what to expect. With a year around population that never dips below 10,000 people, Argostoli is the capital of Kefalonia. Although the town's history stretches back centuries if not millennia, it was rebuilt in 1953 after the devastating earthquake which hit the region. (Personal note – My Granddad was involved in the relief effort when the Royal Navy mobilised to provide aid to the Ionian islands after the earthquake of 53). Argostoli has a number of places of interest to visit including the Archaeological Museum and the Historical and Folklore Museum. You can enjoy pleasant walks along the seafront and take a meal in a restaurant with tables on the waterside. As a seaside resort, many people choose to stay in Argostoli itself and use it as a base from which to explore the rest of Kefalonia. If you aren't actually staying in town itself, it's certainly worth spending the day and/or night in Argostoli. I'm never too sure how to describe the waters of the Ionian Islands. Are they crystal clear or electric blue? Or are they a combination of the both? You'll see for yourself when you visit the incredible beaches of Kefalonia! Kefalonia has dozens of beaches to choose from. Whether you prefer sandy beaches, bays for snorkelling, or stretches of coast for windsurfing, you'll find something to meet your needs. Many people believe this to be the best beach in Kefalonia. Seen from afar, its blue waters and white beach backed by green trees certainly make it one of the most photogenic. It is located on the northwestern coast of Kefalonia, and is well organised, meaning that you can easily hire sunbeds and umbrellas when there – At a price of course! 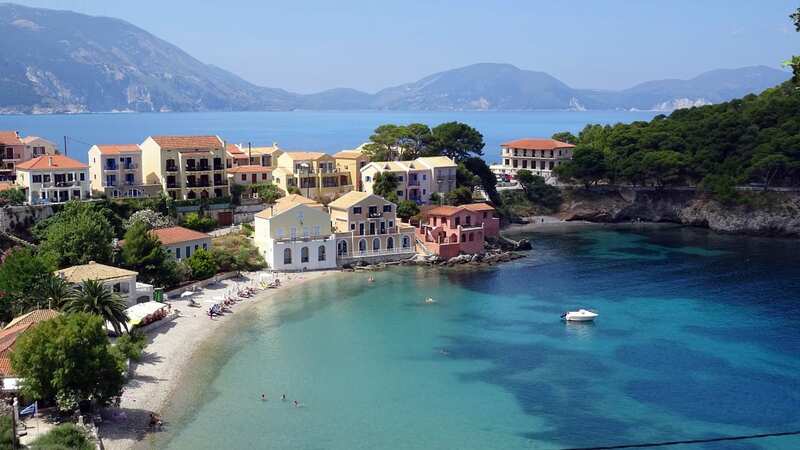 When the film Captain Corelli’s Mandolin was released, people were instantly drawn to just how beautiful Kefalonia is. Once of the beaches that stood out was Antisamos and this perfect beach is just a few kilometers from the port of Sami. A blue flag beach in Kefalonia, Antisamos is organised with sunbeds and umbrellas, as well as access to watersport activities. This beach in Kefalonia derived its name because of the cove's X-shape and it's among the most popular beaches within the island. It's also one of the most suitable for children due to its more shallow waters. If you love tall cliffs that lead to sandy, warm beaches then Petani is the place to visit when in Kefalonia. The beach is located about 20km west of Argostoli and offers some of the most thrilling experiences for surfers because of the large waves. This is a long beach with a clear blue environment on one side and a hilly, green on the other. The beach offers some of the best environments for snorkelling and excursions to hidden caves. Cave lovers will be pleased to know there are several caves to visit in Kefalonia. The island has a unique geology, and the cave systems open to the public are interesting places to visit during a vacation in Kefalonia. Located about 5 km away from Sami, Drogarati Cave in Kefalonia was discovered 300 years ago when a powerful earthquake revealed an entrance to it. Thought to be one of the largest caves in Europe, Drogarati Cave has two main chambers, one of which is 900m2 and is called “Sala of Apotheosis” . This chamber has incredible acoustics, and is occasionally used for concerts and other shows. If you want to be amazed by a natural phenomenon, Drogarati Cave should be on your list of places to visit in Kefalonia. 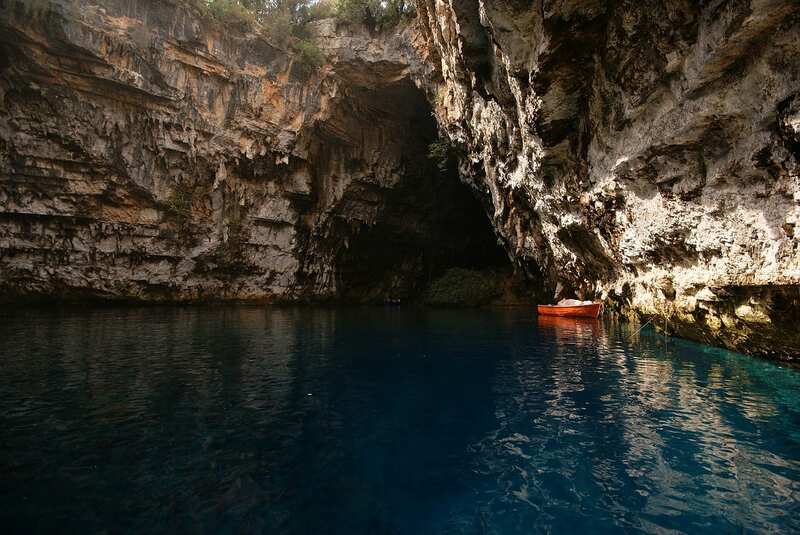 Melissani Cave is located about 2km from the town of Sami, and 10 km from Argostoli. The cave was discovered in the early 1950's, and is now open for people to visit. The opened cave contains what was once an underground lake, and a place of worship for the Ancient Greeks. Several different myths are attached to Melissani Cave in Kefalonia, and it is also known as the Cave of the Nymphs. If you are planning to visit the Melissani Cave in Kefalonia, do so on a bright sunny day. The way the waters in the cave light up are incredible! Visiting the Kefalonia Katavothres, or sinkholes, is one of the most unique experiences you will have in your life. This natural phenomenon has not been fully explained. The area has led geologists to believe that there is a complex system of underground caves, sinkholes and passageways underneath the island. Read more here – The Mystery of Katavothres. Kefalonia is home to a number of pretty little villages scattered all over the island. Each one has something different to offer, and the drive (or bicycle ride!) out to each one certainly worth the journey. The village of Assos in Kefalonia is a small place of about 100 inhabitants. Situated just north of Myrthos Beach, it is often thought of as one of the most beautiful places to visit in Kefalonia. Assos is also home to a Venetian castle built in 14th Century as a fort to offer protection against pirates. The drive from Argostoli to Fiskardo is a very pleasant one with lots of great views. 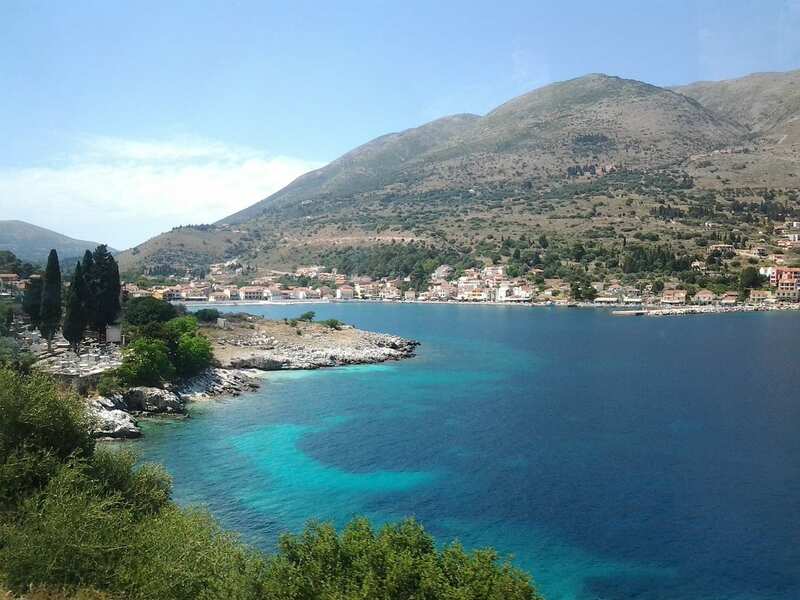 On arrival at Fiskardo village, you will be greeted by what was a traditional fishing community. Sadly, the number of fishing boats is declining as tourism becomes a major driving force on the island. Still, it's a lovely place to visit in Kefalonia, and a great location to enjoy an unhurried meal by the small harbour. Are you a seafood fan? 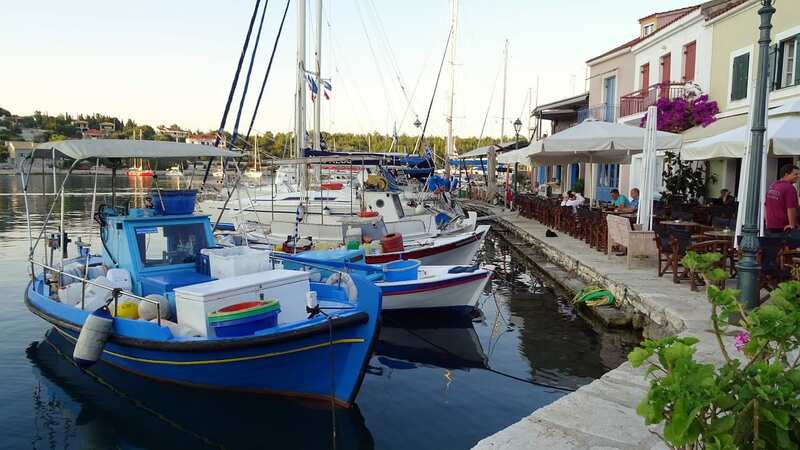 Agia Effimia is a coastal fishing village with some of the best and oldest culinary recipes on the island. It is also home to historic churches, fortresses, and remains of Venetian buildings. Accommodation is also available in Agia Effimia for people who would prefer to base themselves there during their vacation in Kefalonia. This is the second largest town after Argostoli and offers a mesmerising waterfront and a throbbing metropolis of shops, restaurants, unique Venetian buildings, and cafes. The town also offers a historic view of the island evidenced by the remains of ancient structures such as the nearby Acropolis of Sami. The two main castles in Kefalonia are the Castle of St. George and Assos Castle. For a nostalgic view of the island from a historical point of view, be sure to explore the magnificent Castle of Georgios Agios located 5km from Argostoli. The ancient castle was originally built by the Byzantines and adapted by the Venetians. It was the capital of Kefalonia until the mid-18th Century. Positioned above the village of Assos (mentioned earlier), this castle was built in the 16th century. Geo-political changes led to its eventual demise and then abandonment. Today, visitors will enjoy walking around Assos Castle and the views from the top. The monastery is named after the patron of Kefalonia, Saint Gerasimos, and was originally built in the mid-15th Century. It served as the residence of the patron and a mental illness centre where patients were cured of various mental illnesses. It is an impressively built monastery beneath Mount Ainos, where thousands of people come on pilgrimage. Visitors can also view the Saint's tomb and learn ancient practices during his era. No visit to the island of Kefalonia is complete without a visit to the Monastery of Kipoureon. The monastery is set in the most spectacular natural location and you should take the chance to enjoy the natural settings as well as the monastery. Once this place was a bustling centre for worship, but today only one or two monks live in the monastery. However, you will be made to feel welcome and there are some wonderful gardens to wander around along with a collection of interesting relics and icons.